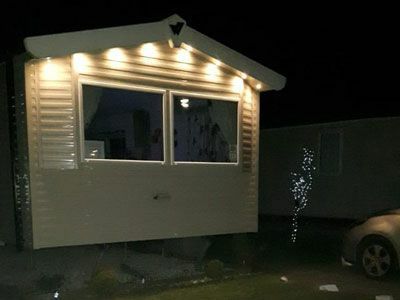 This luxury 2014 Willerby Vacation 35ft x 12ft holiday home sleeps six in three bedrooms. (one double room and two twin rooms) and is ideally situated in the popular Willow Grove Area which is close to the theme park, supermarket, launderette, entertainment centre and restaurants with the swimming pool and golf course a short walk away. The property has double glazing throughout and all bedrooms have warm air plinth heating. Duvets and pillows are provided along with a full compliment of bed linen. A safe is available and there are TV's in two of the three bedrooms. The spacious living room has a flat screen TV with Freeview and DVD player and intergrated dining area. The stylish galley kitchen is well euipped with a gas oven and hob, fridge freezer, microwave, kettle and toaster etc. There is a shower room with a wash basin, toilet and heated towel rail along with a seperate WC and wash basin. Outside there is decking area and a rotary clothes line. A fire extinguisher, carbon monoxide detector and smoke alarm are provided for safety. The caravan is cleaned and checked by the owners and parking is provided on paving at the side of the holiday home. Passes to the theme park, zoo and leisure facilities are purchased seperately from Flamingoland reception. Saturday to Saturday bookings are preferred however short breaks will be considered early and late season.